Author: David Sudlow. Series edited by: Harry Stroomer. 4 pp. Roman, 355 pp. 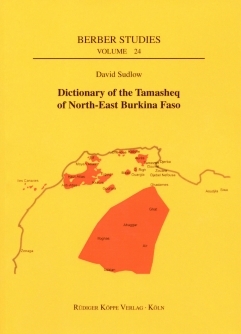 This dictionary covers both dialects of Tamasheq as spoken in Oudalan province of North-East Burkina Faso. These are referred to locally as sha and za. This distinction is the primary one made by local people when talking about the variations that exist in the Tamasheq language locally. While there are many minor variants of the language between different clans, villages and social groups the main division is between sha and za. The majority dialect sha is sometimes called Tamaghit. This dialect is very similar to the majority Tamasheq dialects of Mali. In an earlier grammar of the Burkina dialects the author referred to this dialect as Tadraq. Tadraq is one of the dialects of Mali, and while similar to the Tamaghit of Oudalan has a number of differences. The minority dialect in Oudalan za is often called Tudalt. Tudalt is similar to Western Tawellemmet as spoken around Meneka in Mali and down as far as Bankilaré in Niger. It is also quite similar to the other dialects of Niger. Tudalt varies quite a lot from one speaker to another; the younger generation, especially those who live in towns, often use much sha vocabulary. Here a fairly conservative form of Tudalt is recorded. Where one parent is a Sha speaker and the other a Za speaker, the offspring often speak a hybrid of the two dialects; such hybrid forms are not catalogued here, although some common ones are included. While this dictionary only covers the Burkina dialects, it is largely valid for Mali and West Niger also. Occasionally, forms or meanings from the Mali or Niger dialects are given to illustrate interesting differences. Words from texts from Mali or Niger that are understood locally but perceived as non-indigenous forms are included as well. The primary source for vocabulary was conversations in Oudalan in both Tamaghit and Tudalt contexts. Formal checking, mainly with a Tamaghit-speaking language informant, supplemented this. Words from diverse written sources were investigated both in informal contexts and in structured discussions with language informants. The Tamasheq–English part comprises of roughly 6,500 entries, grouped with their respective word roots for ease of finding. Approximately 5,000 English–Tamasheq entries, less detailed than the previous section act as an index to their Tamasheq counterparts. Furthermore, a learner’s grammar and a Tamasheq text edition is available with us, please see the links below. The Tuareg of the southern Sahara have long attracted a high level of academic and popular interest, and good quality dictionaries of all major varieties already exist. However, Sudlow’s dictionary, shorter but bi-directional, is the first to focus specifically on the dialects of Burkina Faso, complementing the author’s previous grammar of these varieties (Sudlow 2001).